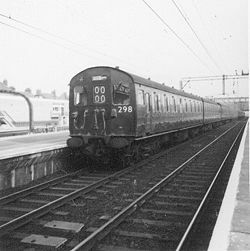 The British Rail Class 302 (pre-TOPS AM2) was a type of electric multiple unit (EMU) introduced between 1958 - 1960 for outer suburban passenger services on the London, Tilbury and Southend Railway route. This class of multiple unit was constructed using the Mark 1 bodyshell and was slam door. This page was last changed on 10 March 2013, at 00:27.